Chaumet invites visitors on a stroll through its history at an exhibition entitled “Promenade Bucolique” in a pop-up museum on Place Vendôme, in the heart of Chaumet’s historic store. 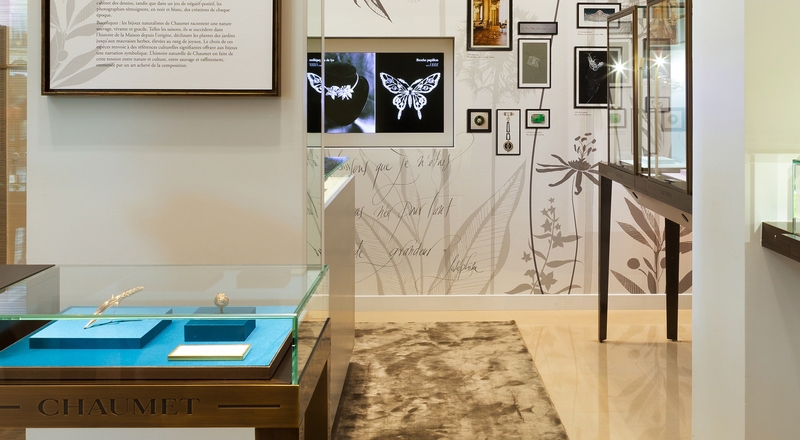 The exhibit spotlights the inspiration the jewelry house has always drawn from naturalism, in a subtle dialogue between past collections and contemporary designs. Visitors are invited to retrace Chaumet’s history through a selection of pieces, from the Romantic period to the 1980s. From initial sketches to photographs taken to immortalize the finished piece, the immersion into Chaumet’s design process is complete. Naturalist-themed pieces convey the grace of wild elements tamed by precious materials, such as the stalks of wheat that decorate the neoclassical tiara made by the jeweler for Empress Marie-Louise. Chaumet creates a dialogue between its historic collections and a new capsule collection. Bees adorn rings, brooches and necklaces set with brightly colored stones evoking springtime, and two limited edition pieces made especially for the exhibit reinterpret the classic theme of wheat stalks. The refined, poetic setting was created by scenographer Elizabeth Leriche. The exhibition runs until January 30, 2016, in the Chaumet store on Place Vendôme.